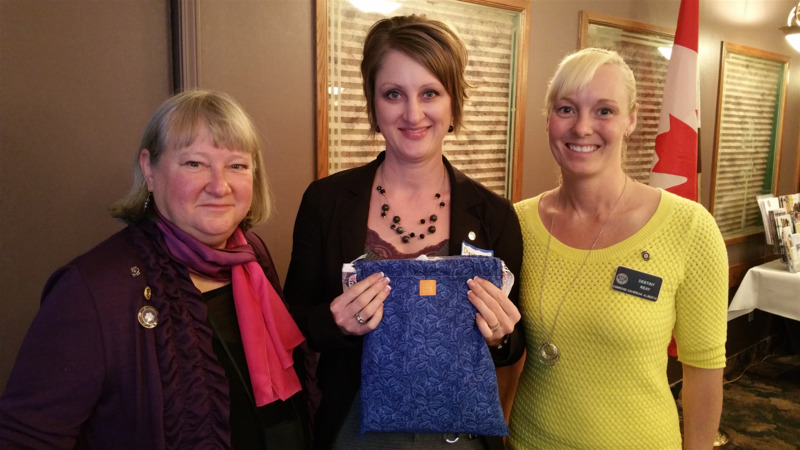 The new Rotary year began in July with 2015-2016 President Destiny Reay (right) handing off the gavel to Carol Breitkreutz (centre). 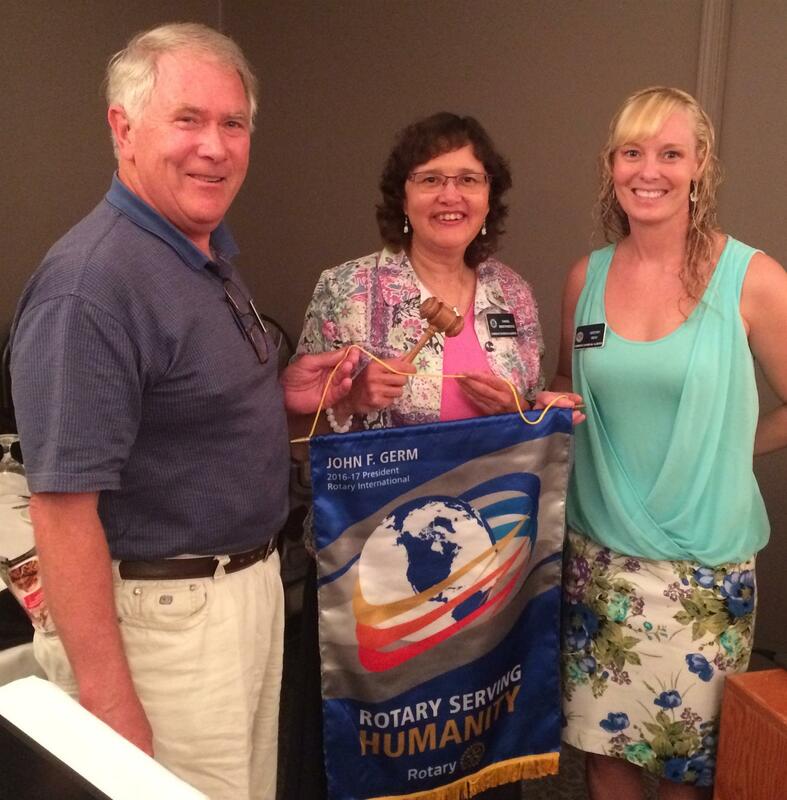 Assistant Governor Ray Hook attended and helped the Daybreak Club usher in the new theme - Rotary Serving Humanity. 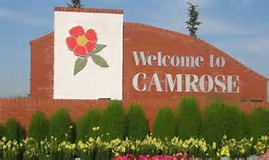 Rotary Club of Camrose Daybreak - 10 Years Old! 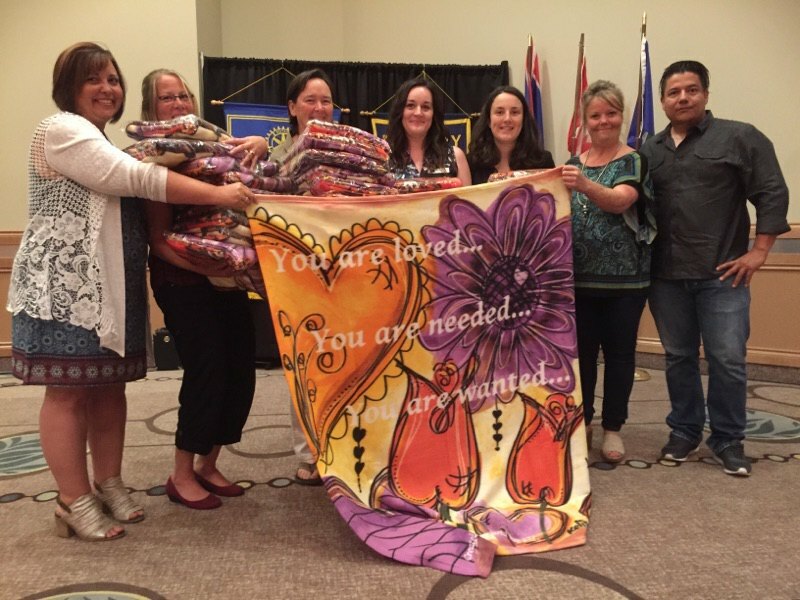 On June 6, 2012 the Rotary Club of Camrose Daybreak celebrated it's 10th year with a "Rib Tickler" - a delicious rib dinner followed by the antics of stand-up comedian, Ken Valgardson. Posing with the cake were (past Presidents) Patrice Johnson, Harry Prest, Larry Johnson, Joy LeBlanc, (current President) Don Forestier,(and past Presidents) Helen Samm, Gerry Lawrence and Christina Rebus. Dr. Epp, the outgoing Dean of the Augustana campus of the University of Alberta, was chosen to receive a Paul Harris Fellowship as a result of his efforts at Augustana throughout his tenure. Dr. Epp oversaw the transition of the University from private to public institution, the joint venture of the Edgeworth Center, the development of the beautiful campus library, and the general trend to see Augustana become more and more engaged with Camrose and the surrounding community, as well as many other accomplishments. Dr. Epp was presented the award at the morning meeting June 21, 2011 by Club President Patrice Johnson. On June 21, 2011 the Daybreak club payed tribute to our late member Phyllis Hempel with an honorary Paul Harris fellowship. Though her membership in the club was brief, she was fondly remembered for her benevolence, passion for community and the founding principles of Rotary. The tribute gave club members an opportunity to reflect on Phyllis as well as her example that a generous nature needs very little time to leave a lasting impact. 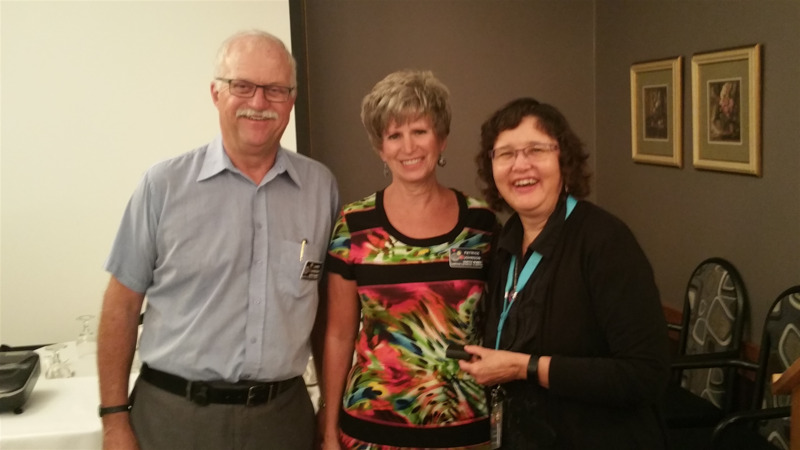 Pictured are Club President Patrice Johnson as she presents the fellowship to Phyllis' husband Ken Hempel at the morning meeting. Camrose Daybreak goes Iron Chef! Saturday, April 30 was the date of an entertaining evening of fun for the Daybreak Rotary Club. Coordinated by Patrice Johnson and staged at the new Home Ec. facilities at Camrose Composite High School, 3 cooking teams were assembled; Team Apple, Cheese and Oreo. Each team had a head chef and was charged with making an appetizer, main course, vegetable and dessert in an "Iron Chef" type of format. While Team Apple was the victor, there were certainly were no losers as the food was fantastic and fun was had by all. Patrice Johnson, club president presents a cheque for $6000 to Ester McDonald of Camrose Association for Community LIving May 31, 2011. CAFCL supports the needs of some of our community's less-abled people, providing housing, help with daily activities and general support. 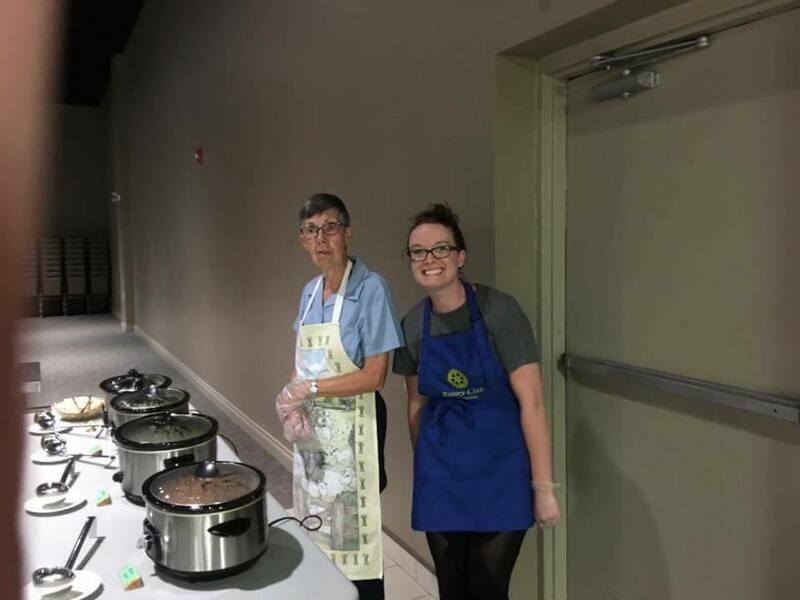 The funds were generated through the club's primary fundraiser "Show A Little Love" a dinner theatre event. On March 8, 2011, the Daybreak club welcomed former rotarians Dennis Johnson and Joel Cassidy as guests to the morning meeting. Though no longer formally a member, Dennis was presented another Paul Harris fellowship earned through donations to the Rotary Foundation. He also donated a second honorary Paul Harris to Joel Cassidy a dedicated community-builder and contributor to Rotary for many years. Pictured are Harry Gaede, Foundation Coordinator, Dennis and Joel as the Fellowships were presented. Preparations for Show a Little Love dinner theatre in February 2011. 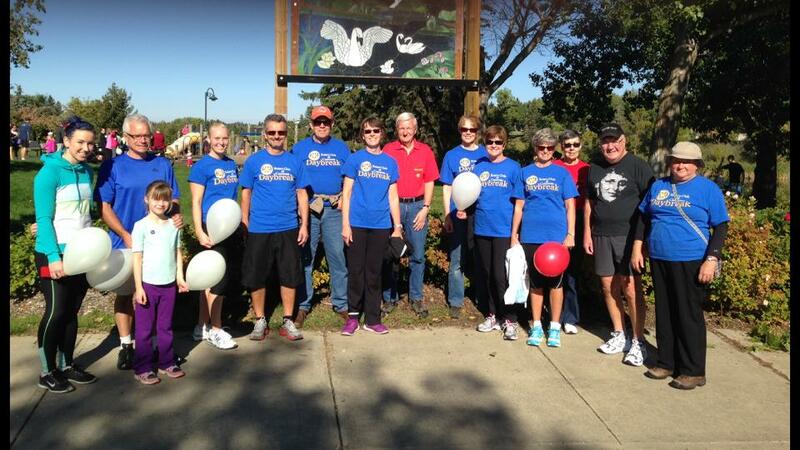 Balloon sales have been a significant contributor to the successful fund-raising associated with this event. Blowing up the volume of balloons required has been a daunting task and this year was no exception. Pictured are Dave Finlay, John Stoddard and incoming DG Larry Johnson. Though these men were very capable, apparently Gail Stolee is the reigning champion for efficiency. Augustana Vocal students again headlined a very successful Show a Little Love Dinner Theatre Feb. 11 and 12 at the Norseman. Reviews on their performance were excellent once again and the community turned out in droves, selling out the Saturday night performance in fact. Funds raised (over $10 000) go to the Augustana vocal program and Camrose Association for Community Living. Both local Rotary, Rotaract and Interact clubs came together to celebrate Rotary Day Feb 24 at the Mirror Lake Centre. Wine, cheese and other refreshments were enjoyed as the stained-glass piece sponsored by Daybreak and titled "Mirror Image" was inaugurated. Mayor Marshall Chalmers pose with Daybreak club president Patrice Johnson. Pat Mader-Mundell (spelling?) spoke Tuesday morning March 1 regarding the work the local chapter of the Grateful Grannies is doing in support of the Stephen Lewis Foundation. The foundation is effecting change at a local level in Africa in an effort to "Turn the Tide" in the fight against AIDS. The focus is on the 14 million AIDS orphans in that region. D.G. 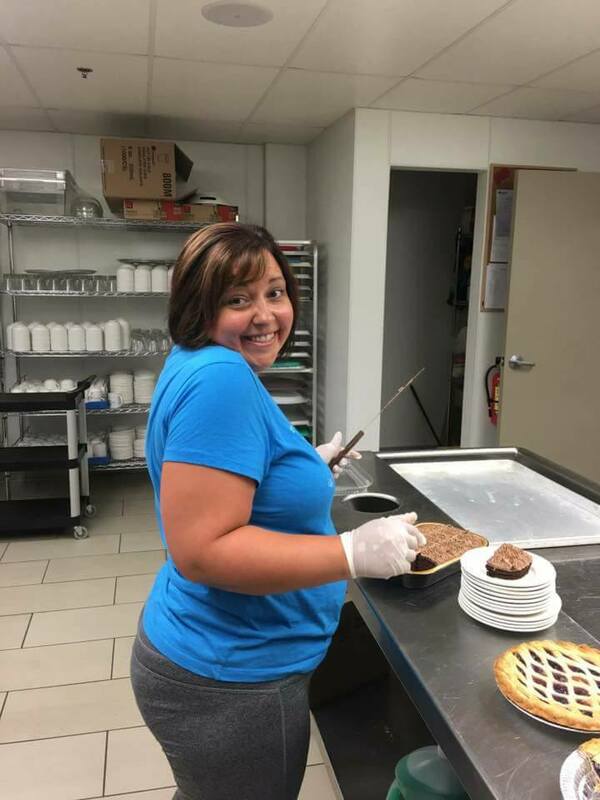 Jackie enjoyed a supper featuring local flavour with our members and guests at CCHS on October 18th. Daybreak Rotary provided these 4 crossing guards and paid the Bill Fowler Centre rental for the Terry Fox Run on September 19th. Daybreak Rotary commissioned Patty Lindstrand to create a work of stained glass art to commemmorate 100 years of Rotary in Canada. The Open Door has a Christmas Wish List of goods they like to keep available throughout the year to hand out to youths using their services. Donations of these items are most appreciated.